- Singular focus on "the corrupt funding of public elections." - A very practiced communicator through all his years of teaching. - Proximity to New Hampshire makes campaigning in that first in the nation state easier. - Notion of a "referendum president" is an alien concept, will require a lot of explanation, and may not go over well with voters looking for a candidate who will address the full spectrum of issues. - Very limited name ID. - Late entry means many voters have aligned with other campaigns. Announcement speech at Earl M. Bourdon Centre in Claremont, NH, Sept. 9, 2015. 2015 - Harvard law professor and activist Lawrence Lessig's has tried a number of different approaches in his crusade against what he calls "the corrupt funding of public elections." He added to those approaches a short-lived longshot campaign for the Democratic nomination for president. On Sept. 9 Lessig announced his candidacy, choosing the symbolic location of the Earl M. Bourdon Centre in Claremont, NH, where in 1995 during a celebrated joint appearance President Bill Clinton and House Speaker Newt Gingrich famously shook hands on the concept of establishing a blue-ribbon commission for lobbying and campaign reform. Lessig joined a field which consisted of frontrunner former Sec. of State Hillary Clinton, the unexpectedly popular Sen. Bernie Sanders, former Gov. Martin O'Malley, former Gov. Lincoln Chafee and former Sen. Jim Webb. It was unclear whether Lessig's campaign would be treated as a quixotic quest or given serious consideration. He announced several well-known operatives had joined his effort (+), and the campaign's early communications were impressive (1, 2, 3). However, the campaign did not manage to get Lessig on the stage for the first Democratic presidential primary debate on Oct. 13. Criteria detailed by the DNC chair on Aug. 6, 2015 set the threshhold at candidates "receiving at least 1% in three national polls, conducted by credible news organizations and polling organizations, in the six weeks prior to the debate." On Nov. 2 Lessig ended his campaign, pointing to his exclusion from the debates (+). 2014 - Lessig was a founder of New Hampshire Rebellion, which sought to introduce the issue of election funding into the New Hampshire primary; that effort started in January when he led a walk most of the length of New Hampshire despite winter weather (+). 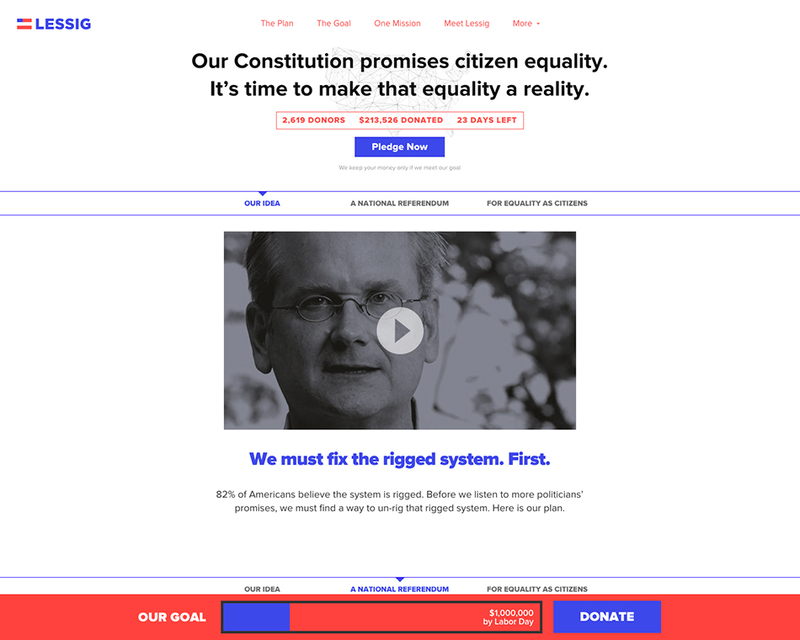 In May Lessig formed Mayday.US "a crowd-funded SuperPAC to end all SuperPACs." Mayday.US sought "to elect a Congress committed to fundamental reform in how campaigns are funded" but had mixed results (+). These projects built on Lessig's earlier efforts to organize support for an Article 5 Constitutional Convention (>). Lessig is the author of seven books. Republic, Lost is being reissued Oct. 2015. Free Culture (Penguin Press HC, 2004). The Future of Ideas (Random House, 2001). Code: And Other Laws of Cyberspace (Basic Books, 1999).